This article covers themes, which are the main way you control the look and feel of your site. Themes provide a set of predefined styles for your site, as well as impacting functionality and other facets of your site. 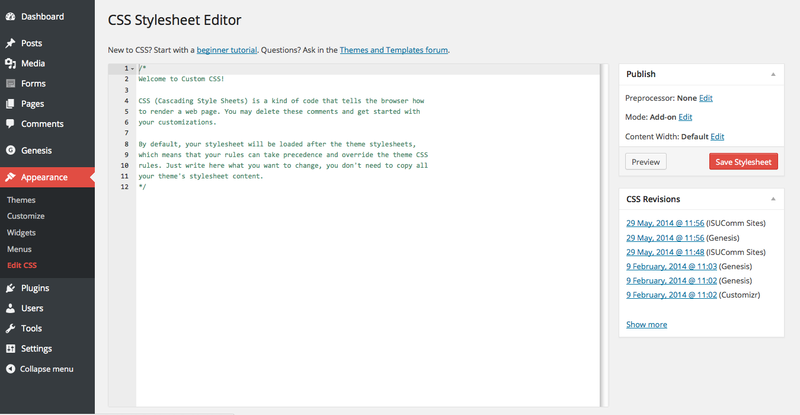 More information about WordPress themes can be found in the Codex article Using Themes. A theme is a way to “skin” your site, or, in other words, to modify the look and presentation of its content. A theme can be used to change colors, layouts, fonts, and more. 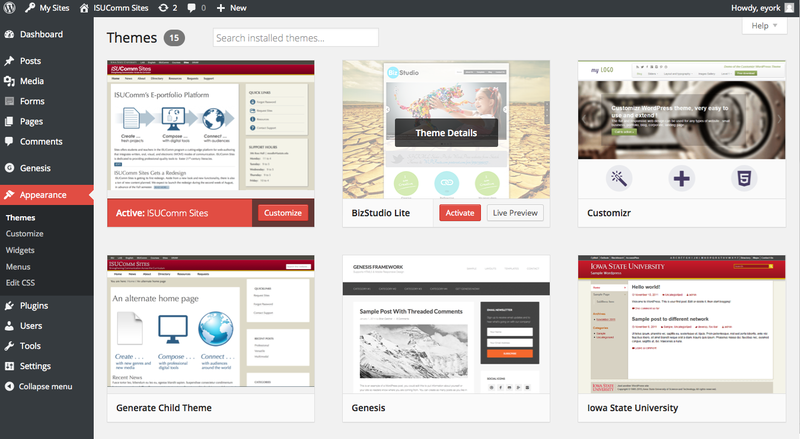 In addition, themes often provide unique features that can help you customize your site. Every theme is different, and no guide could cover them all. Instead, what follows is general information about selecting themes, as well as a few things to keep in mind as you do so. Select and customize available themes from the Themes Menu. What themes can I choose from? 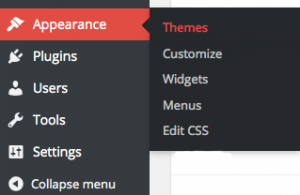 To open the Themes menu, hover over Appearance in the Dashboard. 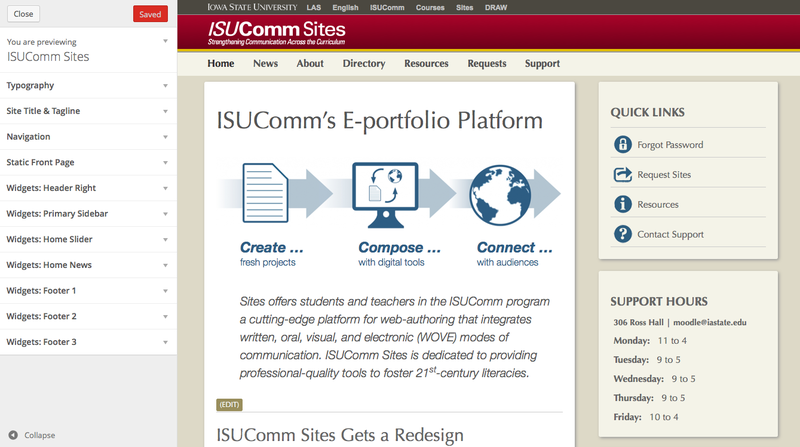 Because ISUComm Sites uses a WordPress network, you cannot install new themes, only choose from those already installed. You can select a theme from your Dashboard by going to Appearance >> Themes and clicking the “Activate” button that appears when you hover over a theme in the list. Once a theme is active, you can customize it further by clicking the “Customize” button, or choosing “Theme Options” from the Appearance dropdown. The customization options you have available are determined by the theme itself. What impact does choosing a theme have on my site? Since the theme controls so much of the look and presentation of the site, this choice will have a large impact of what options you have available. In brief and most importantly, a theme determines the colors, typography, and widget locations available. How can I customize a theme? Themes can often be customized to different extents depending on their capabilities. Clicking on the “Customize” button from the theme selector, or Appearance >> Theme >> Customize from the Dashboard menu will open a panel with options for selecting typography, widget areas, and more. Explore these options, and don’t be afraid to try some, as you can always set them back if you don’t like what happened. Clicking the “Customize” button when a theme is active will provide a wide variety of options. What if I don’t have some option? Theme design is controlled by a coding language called CSS (cascading style sheets). For those with knowledge of CSS, you can add overrides to a theme’s stylesheet to affect just about any aspect of site appearance. Clicking Appearance >> Edit CSS will bring up the CSS overrides page where you can add custom styles. The theme I want isn’t in my list! We try to maintain a list of the best themes, but we cannot make them all available. If you want access to a specific theme, we’d be happy to research whether it is feasible or not, and install it if it is. Just email us at sites@iastate.edu.